When you walk onto your typical university campus, there are a few things you’re sure to notice: crusty professors, lackadaisical students, sports paraphernalia and school colours plastered onto walls, and the student paper. Student newspapers are as ubiquitous to college life as all-nighters and bad karaoke renditions of “Sweet Caroline”. They cover all facets of university life in one publication. Older than campus radio and considerably more permanent and professional than the dozens of blogs that start up and die, student newspapers have been around for a long time, and they’re here to stay. The student press is as old as Canada. The first paper, The Brunswickan, began printing in 1867, the same year as the Constitution. University by university and college by college, the student press swelled from one publication in Fredericton to around 200 nationwide. And as Canada expanded, so did the student press. Most of the initial papers were a hodgepodge arrangement of campus gossip, sports scores, poetry and academic notices, mixed in with the occasional ad for a local druggist. But as Canada began to take itself more seriously in the 30s and 40s, the student press also matured — economic depression and a world war tend to have that effect. The frivolous gossip one would expect in campus publications remained, but bit-by-bit, politics seeped in. For example, The Ubyssey at the University of British Columbia would take a stand against the Japanese internment and uncover racist practices at sororities. It wasn’t until the 1960s, however, that a thriving, aggressive student press would emerge. The editors of these papers were no longer cautious, literary-minded soon-to-be-professionals — as anti-colonialist thought swept the student press, editors became angry and iconoclastic. At that time, the national student newspaper cooperative, the Canadian University Press (CUP), began to play a central role. A national wire service allowed for news of student protests in Montreal to be read by organizers in Vancouver. 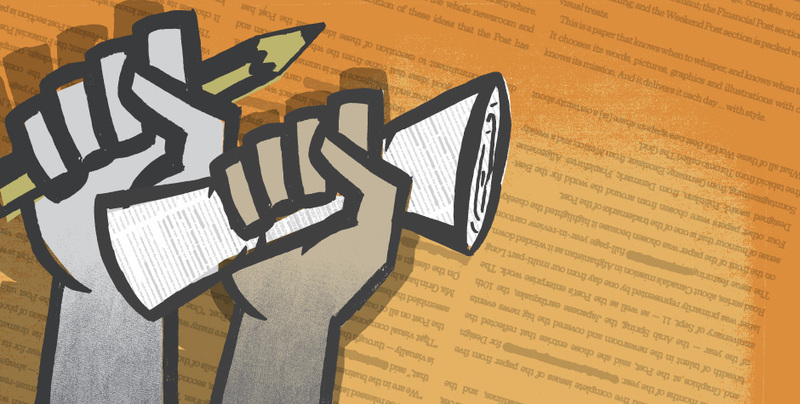 When universities and student unions attempted to stamp out the criticism generated through invective columns, the student press answered in kind, in a united voice. But whatever the powers-that-were may have thought, the student press continued to stand for the powerless. After Pierre Trudeau legalized homosexuality in 1969, an ad to establish Canada’s first “homophile” association was placed in The Varsity at the University of Toronto, eons before mainstream publications would even consider such a move. To this day, the student press invokes awe and ire in equal measure. Student papers are often lauded, criticized, despised and occasionally burned, but they are never ignored. The litany of stories uncovered by student papers in the past few years certainly speaks for itself. The Runner at Kwantlen Polytechnic University in Surrey, B.C. exposed corruption at a student union that fought any of its critics with vicious lawsuits and by hiring private investigators to stalk anyone they saw undermine them. The Link at Concordia University caused a national furor by documenting the horrendous conditions that some international students had to put up with at the university. The University of Alberta suspended a campus fraternity after The Gateway brought to light evidence of some of the most gruesome hazing imaginable. The Ubyssey forced the B.C. Liberals to return ill-gotten donations from not-for-profit organizations. And both Franco and Anglo student reporters put themselves in harms way and were often arrested in their attempts to document the biggest student uprising in North America since the 1960s. If you’re an advertiser, here’s what you should consider regarding the reason students read campus press: If there was a publication in your neighbourhood that took pictures and wrote about friends and acquaintances, wouldn’t you take a peek? Even if you hated the publication, chances are high that you would pick it up and look, almost without fail. To the rest of the world, what happens at universities and colleges, be it research, education, athletics or more trivial goings-on, is rigorously filtered through well-funded and aggressive PR departments. But within the bubble of those schools, students are perceptive enough not to buy the hype. Instead they get their news from their peers. A lot of that is informal — mouth to mouth and tweet to tweet — but the rest comes from on-campus media. Much of what student newspapers do, especially in culture, life and opinions, can be seen as a perpetual gossip mill gathered, crafted and polished by people with keen storytelling abilities. That goes hand-in-hand with the news and sports pages, which focus on issues that major media outlets rarely touch. Compared to the United States, the number of college sports reporters in Canadian mainstream media organizations is pitiable. And the number of full-time post-secondary reporters in this country can be counted on one hand, with fingers to spare. No one else is going to tell you the score of the womens’ volleyball game (which you’re interested in because your ex-roommate is on the team) or how student fees for commerce students is doubling next semester (which you need to know because you’ve been thinking about buying a new bike). And students are always, always going to want to know if the bar’s been shut down because of liquor violations. At the end of the day, student newspapers report on what matters to students because they are students. And students read student newspapers because student newspapers are about them. The Varsity at the University of Toronto perfectly demonstrates the idea that by focusing on student-oriented content, huge gains can be made. The paper has seen circulation increase by 50 per cent just in the past year — a massive gain considering they already had a weekly circulation of 20,000. According to Joshua Oliver, the editor-in-chief of The Varsity, by focusing on original campus content, the paper was able to successfully increase their readership. “Our news section reports exclusively on campus news and on issues that directly effect students,” he said. “News, especially breaking news, is reliably our most-read content.” This is despite the fact that big-name dailies like the Toronto Star, Metro and 24 Hours distribute on campus for free. Oliver also referred to a yearlong marketing effort and comprehensive social media strategy that helped attract new readers online. And while it may seem counterintuitive that an increased online presence would lead to more print readers, it’s a strategy that The Ubyssey has also had success with. In 2011, The Ubyssey completely overhauled their website and social media strategy, while also changing their print issue. And because the website was updated daily and The Ubyssey was incredibly active on social media (it has the most Twitter followers of any paper in the country), students become more and more aware of what the paper did and increasingly reliant on it for their daily news. And combined with a Globe and Mail-inspired redesign, including glossy paper, more colour images and a special focus on front-pages and photography, those online readers were also more likely to pick up the paper itself while in the student union building or on the bus. Other papers that did similar redesigns have also seen increases in their circulation. Nexus at Camosun College, The Runner at Kwantlen Polytechnic University and The Link at BCIT have all had readership increase the past few years after redesigns. And while the student press remains focused on student issues, they’re also taking advantage of the relative decline of other papers and moving into new markets, such as community news. More and more, student papers are taking readers away from Canada’s increasingly stodgy press in large cities by serving young people in growing communities. Papers like The Lance in Windsor or The Omega in Kamloops are as likely to be found in off-campus hotspots as they are in the student union building. Reporters at these papers tend to be cultural omnivores involved in many facets of their community. And while reporters at mainstream papers have children and mortgages to spend their time fussing over, student journalists live what they report. Papers like the Brock Press at Brock University and The Uniter at the University of Winnipeg have seen significant gains in circulation by pushing a community-oriented strategy. But there’s another, tangible reason student papers will thrive. Most get their money through a mandatory levy that all students must pay into. This means that student papers know approximately how much money they’ll have year after year, and can plan accordingly. In fact, this is the model that most major newspapers are now aspiring to. Taking the example of the New York Times, papers are looking to substitute fickle ad revenue with more consistent money from print and online subscriptions. Ironically, by stabilizing the finances of these papers, it allows for long-term planning and makes them a better medium for print and online ads. Imagine if some struggling major newspapers could levy a tax on everyone within their city limits – a power that most student papers have; they’d certainly be holding up a lot better. In some ways, student newspapers have the best of two worlds. They’re brands that are forever associated with their institutions, but they’re also staffed by young, ambitious, tech-savvy careerists, who pour all of their passion into their enterprise. The best endorsement of the quality of the Canadian student press comes from people who have devoted years of their lives to it. Artists, writers and creators found their first outlets in the pages of student newspapers (Leonard Cohen, Stephen Leacock, Kate Beaton, Jeff Wall). Many journalistic institutions in this country, and many of the major insititutions in the States, are filled with student press alumni. Columnists (Doug Saunders, Vaughan Palmer), reporters (Nala Ayad, Andre Picard), anchors (Ian Hanomansingh, Lisa LaFlamme), and editors-in-chief (John Stackhouse), were all once student journalists. At the end of it all, that’s the most important thing to remember about the student press. They’ve got a lot of things going for them — a built-in audience, financial stability, expanding niches — but the most essential, irreplaceable facet is that they’re staffed by some of the most talented and passionate young people in Canada, and they will only continue to do so.